Ouzo F.C was founded on two basic principles: Play hard and Drink hard. Since 2002, we have created a foundation of players who stick to this philosophy for every game, week in and week out. We not only look for players who make their presence felt on the pitch, but in the pub as well. Each member of our team takes pride in what they do on and off the field. That’s why if you ever come to Winger’s Lounge on a Sunday, you will notice the boys of Ouzo F.C throwing back pitchers and eating their “famous chicken wings”. One thing is for sure, we don’t leave Soccer City on Sundays without showing a little Blood, Sweat and BeersTM . Ouzo F.C first began their quest for supremacy by battling it out in the 3rd division. After taking plenty of knocks and bruises they were promoted to the 2nd division, which is where they first met their rivals “Barcelona”, who are known today as Arnold and Bart, or should I say “Bert and Ernie”. 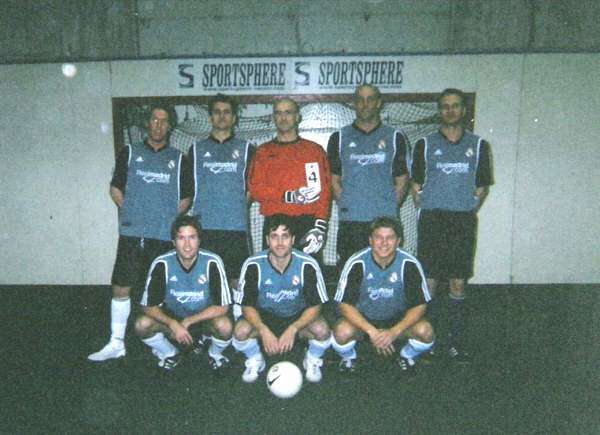 After winning the regular season in Division 2 in 2002, they faced their nemesis Barcelona in the Play-off Championship match. After going up 5-3 with just under 10 minutes left, Ouzo’s lack of fitness cost them and as a result lost a heartbreaker 6-5. Some still say that was the best game Soccer City has ever seen, or at least that’s what we said after a few pitchers each after the game. After getting promoted to the 1st division in 2003, Ouzo has seen their share of ups and downs. Finishing as high as 1st and as low as 6th in the 6 seasons in the 1st division. 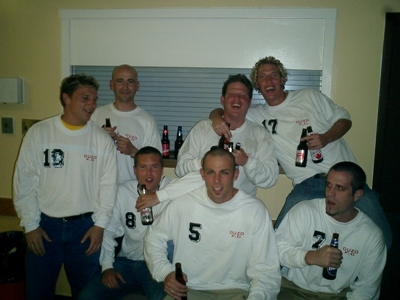 A heartbreak loss to Raging Bulls in the Final of 2004 and a 2-1 defeat to West Way in the Final of 2007 were the closest the boys came to their beloved Banquet (Free beer and wings) in the 1st division. That all changed in the Fall of 2008 when Ouzo went undefeated in the 1st Division and won the league for the first time in 7 years. In 2009, Ouzo F.C officially became an Indoor Futball Club by creating a second team in the Thursday 1st Division. Ouzo II continue to play there today. 2010 was a monumental year for Ouzo FC. It marked the first time the team has ever gone undefeated in a Season, playoffs included. The year of "The Double" was a first for the Club, and continues to be a benchmark for future teams going forward.